Imported from Vietnam. Photos are the actual fish you will be receiving! I am based in San Antonio, TX. 2 high quality super plakat fighters batch #40 from Malaysia. Bloodline: Thai x Malay, Age: 9 months, Size: 1.70-1.80g, they are well conditioned, eating well, healthy and very active. Hello my fellow betta lovers! This Male is gorgeous! Imported from Vietnam. 4-5 months old. IF FISH ARRIVED DEAD WITH FOLLOWING DOA RULE. ✬ All pic are taken by myself and exact fish will be receive for sure ………. ✬ FISH VIDEO Gender: MALE. ✬ All pic are taken by myself and exact fish will be receive for sure ………. IF FISH ARRIVED DEAD WITH FOLLOWING DOA RULE. ✬ FISH VIDEO Gender: MALE. IF FISH ARRIVED DEAD WITH FOLLOWING DOA RULE. ✬ All pic are taken by myself and exact fish will be receive for sure ………. ✬ FISH VIDEO Gender: MALE. Age: 12 - 17 weeks old. 2 High quality super plakat fighter males batch #93. Bloodline: Thai x Malay, Age: 8.5 months, Size: 1.80g, fish is well conditioned, eating well, healthy and very active. High quality 5 plakat fighter batch #99 Male #4. Bloodline: Malay, Age: 8 months, Size: 1.60, fish is very well conditioned, eating well, healthy and very active. Pictures of the entire bag are required. Upgraded insulation in boxes for fish in colder weather. I will send you 5 random female bettas. Blue, green, red, white, marbles, purple, almost every color imaginable. These will all be picked at RANDOM but we will try to get you different colors! High quality super red dragon HMPK pair. They are 4 months old, well conditioned, eating well, healthy and very active. High quality imported fancy Nemo koi HMPK pair. They are 4 months old, well conditioned, eating well, healthy and very active. High quality big size female fighter. Size: 2.65g, bloodline: Thai, she is ready to breed, well, healthy and very active. High quality top fighter batch #28. Bloodline: Thai x Malay, Age: 8 months, Size: 1.70g, fish is very well conditioned, eating well, healthy and very active. They are healthy, aggressive, & beautiful! BETTA TYPE: BETTA PLAKAT FIGHTER. ✩✩✩✩✩✩✩✩Texas Tom Plakat ✩✩✩✩✩✩✩. I try to include the different color spectrum when taking pics. • Pointers: if a betta has full colors and good sizing, it is most likely a mature fish if not a giant type. Due to the marble gene, it is always within the realm of possibility for a betta to change color. IF FISH ARRIVED DEAD WITH FOLLOWING DOA RULE. and ready for a new loving family. Failure to do so will result in an Automatic Case Opening. High quality 5 batch #137 male #3. Bloodline: Thai Indo, Age: 8 months, Size: 1.70g, fish is very well conditioned, eating well, healthy and very active. AWESOME DEALS!! Betta Plakat Super Fighters ( 6 Fish!!!) MP#10 Free Shipping!! All Fish will be catch fresh from the pond. Fish are 10 months old, and are Large size 2.0 grams and plus. THIS IS FOR 6 Arena Champion Bloodline FISH! Very well conditioned, eating well, healthy and very active. Due to the marble gene, it is always within the realm of possibility for a betta to change color. and ready for a new loving family. Failure to do so will result in an Automatic Case Opening. male black samurai HMPK very healthy & aggressive . Young born in November 1 -2018 never breeding befor . Picture u see is exactly fish you will receive . In case of DOA do not open bag , take some clearly picture sent to me in 2 hours of arrival time , i refund full , after that will not accepted . I ship fish only Monday ( maybe Tuesday ) Ebay new rule have to post express 1 day ship , but it cost $25 to ship each fish . I use priority 2-3 ship . Imported Nemo HMPK Betta Pair around 4 months old. This is Male Wild Betta, Mahachai spade tail. Type- WILD BETTA. LIVE BETTA Their colors look more pale, due to traveling. NEVER use tap water. Water temperature between 75-81 degree is ideal. Gender- male. 2 high quality big size green super Bagan fighter. Size: 2.50-2.70g, Age: 10 months, they are both very well conditioned, eating well, healthy and very active. Fancy RED KOI Halfmoon Plakat HMPK (Male) Betta Fish - YouTube. This Beautiful Betta was IMPORTED from Thailand. NATURAL OF BETTA Gender: Male. These are mostly the changable colors between inside & outside tanks. RAINBOW CANDY GALAXY. GRADE A. When the fish arrives, DO NOT OPEN your bag. We appreciate your doing this. WE APPRECIATE YOU UNDERSTAND ABOUT THAT. We often feed 1 bloodworm for the 1. Imported Nemo HMPK Betta Pair around 3 months old. Free Ship using Priority Mail. BuyItNow or Buy 2 auctions get one free female. Next shipment date: 5/3/19 from Vietnam. 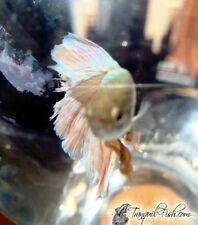 Betta Super Plakat Fighters #351 *****Indo***** 2 Fish!!! 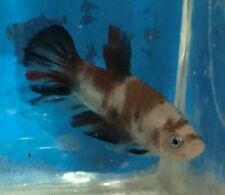 2 high quality Indo betta Fighter males (Very aggressive). Age: 9 months, Size: 1.70-1.80g, they are both very well conditioned, eating well, healthy and very active. Must Know How To Take Care Betta and Their Habits. Detail: HMPK Fancy Milkshake Flower Tail Pattern. - When Arrive Fish Might Appear Dull Due To Stress And Tired Let It Rest Fish Will Regain Its Color And Form Later, Fish Might Change Due To Their Marble Gene Or As They Matured. BETTA TYPE: HMPK HELLBOY GALAXY. • Half-moon plakat koi (HMPK) bettas may have color and pattern changes as they mature due to their MARBLING genes. Once they reach about 1 year of age, their colors and patterns are more permanent. They are healthy, aggressive, & beautiful! 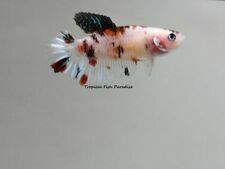 BETTA TYPE: HMPK FanCy Galaxy koi. • Half-moon plakat koi (HMPK) bettas may have color and pattern changes as they mature due to their MARBLING genes. Once they reach about 1 year of age, their colors and patterns are more permanent. High quality imported super black dragon Male HMPK. He is 4 months old, well conditioned, eating well, healthy and very active. Your little betta will arrive to you safe. Local pickup : Dallas ,Texas. NOTE : When you open the box, you'll see fish look pale. It's because of stress from long travelling. Because beauty is held within the eye of the beholder, your fish may be more beautiful or less beautiful to you if it happens to change. This prevents a box of fish from sitting on your porch in the heat or cold. Betta fish are beautiful to look at and peaceful to watch. They thrive in fish bowls and special tanks, especially those with live or imitation plants. These fish are easy to care for, making them a low-maintenance exotic pet. How can you tell the gender of the Betta fish? Color- Males have brighter colors, while females have lighter bodies. Red, green, or bright blue on the fish's body is a good sign it's a boy. Fin - Males have longer, showier fins that can be double or triple their body height. Females have shorter ones, and their ventral fin (on their underside) looks similar to a comb. Egg Spots-If you look closely, a female will have a white spot about the size of a grain of sand located on its underside in front of the ventral. The Mirror Trick - If you put a mirror beside the fish tank, a male Betta will flare up, showing off his pretty fins and tail. Why do some people call Bettas 'Siamese Fighting Fish'? If two Betta males are placed near each other, even if they're looking at each other through separate fish bowls, they will try to fight each other. Males should never be put in the same tank because they will try to kill each other. Where does the Betta fish come from? Why do Betta fish blow lots of bubbles? That is how female Bettas make their nests. Can you put Betta in aquarium with other fish? Male Bettas need to be kept separate from fish of any kind, but female can live with other fish. How big do Betta get, and what's their lifespan? Full grown Betta are about two-and-a-half inches long, not including their tail. They can live to be three years old. What do Siamese Fighting Fish eat, and how do you feed them? Betta fish eat flakes, pellets, and freeze-dried bloodworms. Give them only as much food as they can finish eating in two minutes. Overfeeding is not good for their health. Do you have to have a filter for a Betta fish? No, they don't need to have their water filtered or aerated, and they don't like the way a filter makes the water in their tank move. What size of bowl is best for Betta fish? They need a home that contains at least two-and-a-half gallons of water. Many large bowls and small tanks are available. Bettas are often sold and displayed in tiny bowls and cups but can live in them permanently.